But what money could you win for real? As I am doing some data science courses currently I was interested in what you can win honestly by taking part in Radio N1’s lottery. Therefore I wrote a code in R Studio which runs a Monte Carlo Simulation considering the chance per direct win (for more information on the „BayernLos“ and its odds look here). The plot below shows the outcome of a simulation of 1.000.000 simulated lottery runs. The minimum amount in the 1.000.000 simulated lotteries was 214 EUR, the maximum 300.782 EUR. So it contained 1 direct jackpot ticket. In average you get 509.40 EUR (blue line in plot). In 95% of the cases you will win less than 5553.37 EUR (green line). 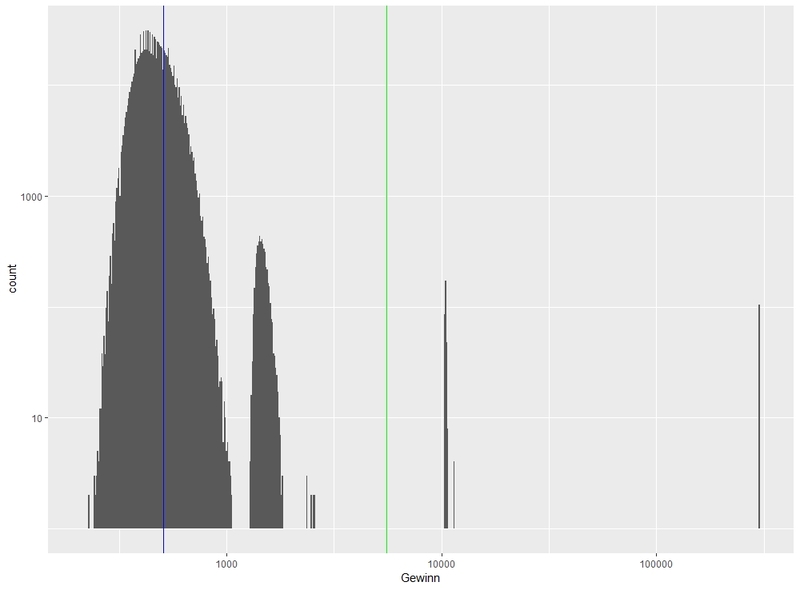 If you are interested in the code behind the plot, check my public Github repository. I hope you enjoyed this little excursion into Data Science an I am looking forward to receive some feedback from you.